73-year-old female presents with glare in the right eye 5 months after cataract surgery. The patient had cataract surgery in both eyes with monofocal lens implants five months prior to presentation. She elected to undergo cataract surgery to diminish glare with lights, but notes that her glare on presentation is much worse since surgery. She complains of glare in the right eye since the first day after surgery. The glare occurs both indoors and outdoors and as a result, she is unable to drive at night. The glare does not improve when she wears her glasses. She denies any decrease in vision and feels that her vision has improved since cataract surgery, despite the worsening glare. When describing the appearance of the glare, she says it is linear and always oriented in the same direction. The line of glare points from about 2:00 to 8:00. The patient was able to illustrate this on an Amsler grid (Figure 1). Figure 1. The patient drew the appearance of the line of glare in her right eye on an Amsler grid. A complete review of systems was performed and negative except for as mentioned in the history of present illness. Equally, but minimally reactive. No relative afferent pupillary defect was found. Figure 2. (A) Slit lamp photo of the right eye demonstrating posterior capsular folds. 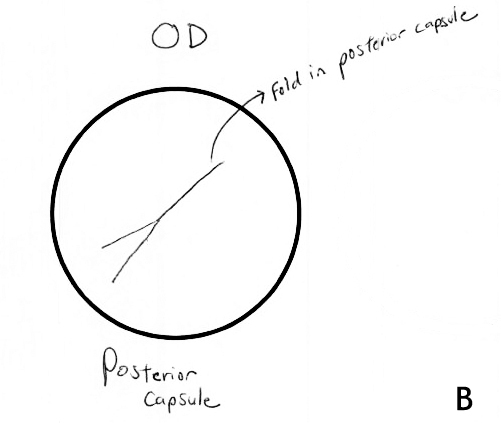 (B) Physician drawing of the fold in posterior capsule as seen through the slit lamp. 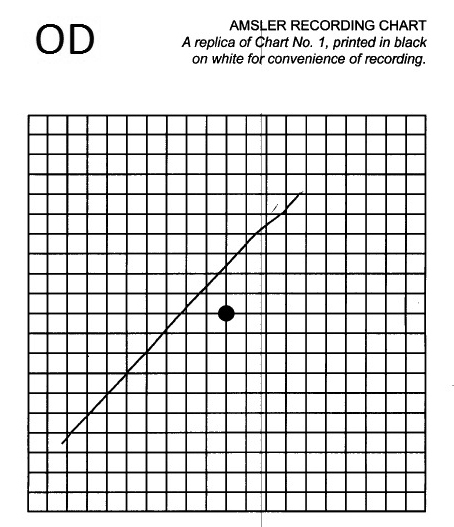 Note the similarity between the direction of the fold and what the patient drew in on Amsler grid (Figure 1). The patient describes a line of glare, which is causing a Maddox rod effect, and corresponds to the fold in the posterior capsule in the right eye. The option of a neodymium-doped yttrium aluminum garnet (Nd:YAG) laser posterior capsulotomy on the right eye was discussed with the patient, and she elected to proceed with this laser procedure. One month after Nd:YAG laser posterior capsulotomy, the patient noted that the glare was not as bothersome as it was before undergoing the procedure. On slit lamp examination of the right eye, there was a central opening in the posterior capsule. The patient continues to notice some streaks of glare, but it is much less significant. Overall, she is pleased with the visual outcome following the Nd:YAG capsulotomy. The Maddox rod was developed in 1890 and is used in clinical ophthalmology for the detection of heterophoria . The Maddox rod is constructed with multiple plastic cylindrical rods lined up successively, where incident light is spread to form a streak perpendicular to the orientation of the rods. Thus, the case described here represents a Maddox rod effect, where the posterior capsule folds served as a cylindrical lens through which the incident light creates a bothersome streak observed 90 degrees from the aberration. Holladay et. al  similarly reported the presence of annoying light streaks and glare following cataract extraction and attributed the symptoms to high plus cylinders within the patient's optical system. Although the visual aberration in our case was identified at the posterior capsule, cylindrical aberrations anywhere in the visual axis may become symptomatic. Choi  reported similar Maddox rod effect causing symptomatic light streaks or starburst from laser in situ keratomileusis (LASIK) flap striae. Due to the acute onset of complaints as early as the day of surgery, symptomatic folds may be an intraoperative phenomenon or likely manifest early in the postoperative period and progress in the process of capsular opacification and contraction. Capsular opacification originates from viable lens epithelial cells left behind after removal of the nucleus and cortex in cataract surgery. Wrinkling and contraction of the posterior capsule is exacerbated by the ability of the lens epithelial cells to undergo metaplasia and conversion into myofibroblasts. A matrix of fibrous and basement membrane collagen is produced by myofibroblast and resulting symptoms of glare and distortion of vision can be due to the contraction of this collagen matrix . Longitudinal folds within the posterior capsule have been observed intraoperatively and may play a role in the symptomatic glare and visual distortion after cataract removal. The presence of posterior capsule folds occurs after lens implantation. 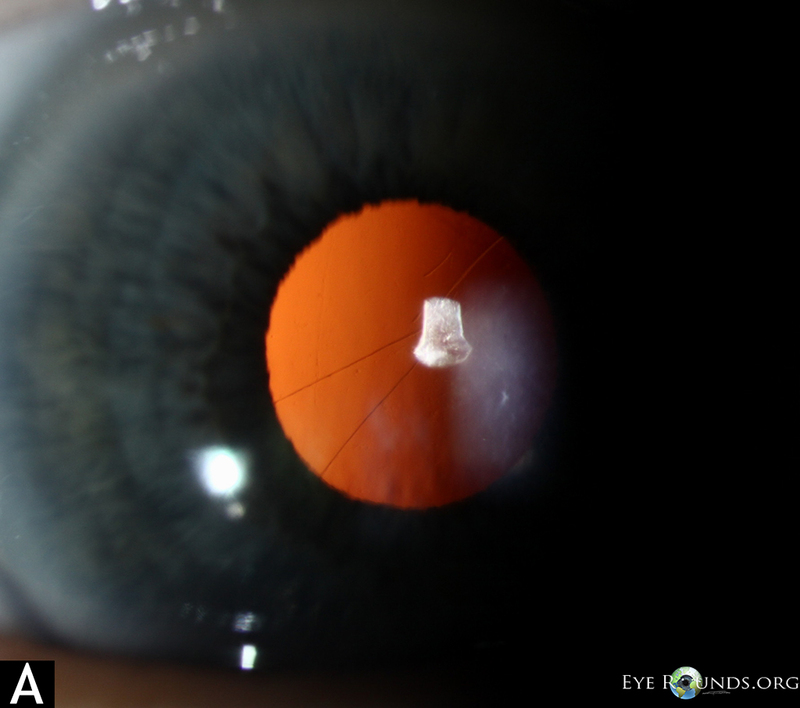 The folds are oriented along the longitudinal axis of the intraocular lens (IOL) as a result of the disparity in size of the IOL and capsular bag . Vasavada  and Durak  made observations of posterior capsule folds that led to the belief that a "longitudinal striae sign" (presence of the folds) was an indicator of complete removal of ophthalmic viscosurgical device (OVD). Blomquist , however, noticed that these folds were often present before the complete removal of OVD and that the folds were more likely a function of IOL design and haptic material. The presence of posterior capsule folds and opacification seems to be related to the design and material of intraocular lens implant. For example, the presence of posterior capsular folds appears in 43% of patients with an Alcon Acrysof MA60BM lens which is a 3-piece polymethylmethacrylate (PMMA) lens and only 2% with an Alcon AcrySof SA30AL lens which is a single-piece acrylic lens . The 3-year incidence of opacification has been reported at 56% for PMMA, 40% for silicone, and 10% for acrylic material . Nd:YAG laser is a standard procedure for treating secondary opacification of the posterior capsule . Use of the Nd:YAG laser for opening of the posterior capsule is relatively safe and has a success rate upwards of 95% . The need for Nd:YAG laser capsulotomy varies depending on the chosen lens implant. A postmortem study reported the prevalence of Nd:YAG capsulotomy of 0.9% for acrylic intraocular lenses (IOLs), 12-21% for silicone IOLs, and 27-33% for PMMA IOLs . Use of the Nd:YAG capsulotomy is indicated for glare caused by posterior capsule opacification or wrinkling encroaching on the visual axis in a patient with symptomatically decreased best-corrected visual acuity and otherwise clear media . Maddox EE. A new test for heterophoria (Maddox rod). Ophthalmic Rev 1890; 9:129-133. Holladay JT, Bishop JE, Lewis JW. Diagnosis and treatment of mysterious light streaks seen by patients following extracapsular cataract extraction. J Am Intraocul Implant Soc 1985;11(1):21-3. Choi CJ, Melki SA. Maddox rod effect to confirm the visual significance of laser in situ keratomileusis flap striae. J Cataract Refract Surg 2011; 37:1748-1750. Lens and Cataract, section 11. Basic and Clinical Sciences Course. San Francisco: American Academy of Ophthalmology, 2004. Blomquist PH, Kelly JL. Posterior capsule folds and removal of ophthalmic viscosurgical devices. J Cataract Refract Surg 2002; 28:1565-67. Vasavada AR, Trivedi RH. Posterior capsule striae. J Cataract Refract Surg 1999; 25:1527-1531. Durak I, Oner FH. Clue to complete removal of OVD during phacoemulsification [letter]. J Cataract Refract Surg 2000; 26:633-634. Apple DJ, Peng Q, Visessook N, et al. Eradication of posterior capsule opacification: documentation of a marked decrease in Nd:YAG laser posterior capsulotomy rates noted in an analysis of 5416 pseudophakic human eyes obtained postmortem. Ophthalmology 2001;108:505-518.